It is important for us to be as gracious of a guests as you are when you’re the one hosting the party. When you’re invited to someone’s home for dinner or a party, it is always appropriate to bring a hostess gift - the obvious choices being flowers and wine. When I’m hosting a party, while I appreciate these sort of gifts, I’ve already arranged my flowers and have selected wine to serve. So when I’m the one giving the hostess gift, I like to think about what the host would really appreciate- something she can look forward to enjoying after the party is over. Because your host has likely spent a great deal of time and energy preparing for the party, breakfast the next day is probably the last thing from her mind. Wouldn’t it be so nice for her to wake up tomorrow morning after an evening of entertaining to a special treat waiting for her in the kitchen? 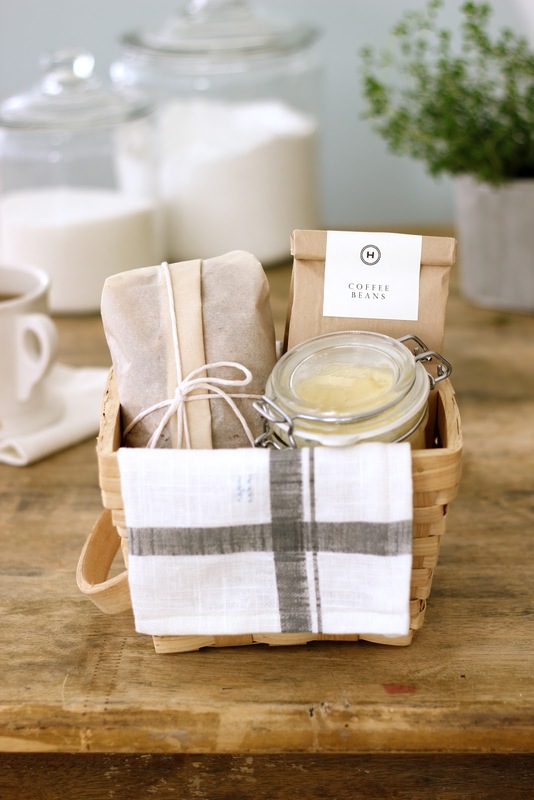 Create a breakfast basket filled with homemade (or home-packaged!) goodies like moist and dense banana bread, creamy whipped honey butter and a special blend of your favorite gourmet coffee beans. Wrap the banana bread in parchment paper, then tie it with kitchen twine or string to secure the ends. To make honey butter, place softened butter in a mixer with the paddle attachment. For every stick of butter, add 3 tablespoons of honey and a pinch of sea salt. Whip together on high for 3 minutes. Put the butter in a glass jar fitted with a lid. Store in the refrigerator. Grind coffee and scoop it into a small craft paper bag with a secure folded top. Add a printed label for a special touch - click here to see my custom printed labels. To package, use a small basket or box lined with a kitchen towel or Monogrammed Linen Napkin (click here to see my favorites from my store). For more baking inspiration - see my mini Baking Pantry Upgrade. Also, for all of my resources to the packaging used here, visit my online store. That is truly a beautiful gift! Great idea! I love it!! Jenny, where do you design your labels/tags: word, adobe? Do you use the Xyron for the coffee bean label?? The styling is just perfect! Meg- I used Adobe InDesign for these, but I think you can easily use Word. They are labels from Paper-Source (link added to the post above). They have templates you can download for each type of label... making it really easy and quick to make labels. 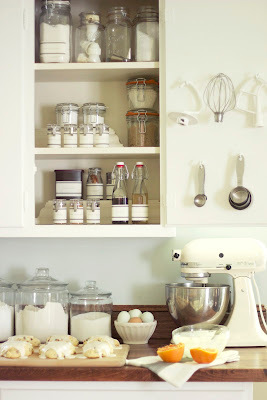 I'm planning to do a post for 'how-to' labels soon! Jenny, Beautiful; thank you! I have been looking for a soft, honey butter recipe so doubly like your list. I am looking forward to your upcoming post on labels. This is one of my favorite hostess gifts to give and receive! When I host a party I also like to send my guests home with a little something and I have done mini loaves of banana or pumpkin bread with a small package of coffee for each guest...perfect morning after the late night party breakfast! Can't wait to try the honey butter recipe. Jenny - another quick question. I am recently engaged and I plan on doing the centerpieces myself. I am recycling old jars of all shapes and sizes and plan on putting rustic ribbon around them - jute, burlap, etc. with subtle stitching. Any suggestions on where I can get quality, classic ribbon? Paper Source has a great "Cement Stripe Cotton Ribbon" that is along the lines I am thinking about. I also love the "Blue Jute Webbing" from burlapfabric.com. Are there any other websites you can think of?? THANKS!! Suggestions from others are welcome!! Jenny, this is inspiring! I wish I had a party to attend so I could make this sweet gift for them! Maybe I will just bring it to my mother-in-law and earn some brownie points. Have you done a previous post for the banana bread shown in the picture? It looks so delicious. What a great idea. I entertain alot and would personally love to receive a breakfast bread. A brilliant gift idea!!!!!!! I love it. I know I would love to get this, thanks for the wonderful idea and beautiful inspirations. Now that is adorable! I would love to get something like that. Your photos are great. I read all about your outside "studio" and painted boards you have for background. They look so professional. I use them as a "maybe someday" goal. what a lovely idea. Thanks for the inspiration! Love this idea! Anyone who receives this gift would be thrilled! Love your blog -- found it on tastespotting! I made this a couple weeks ago, it's so simple and fun to make! Thanks Jenny for the inspiration! This is such a cute idea and I love the presentation. I think I will give one of these this weekend to a friend. Thanks for sharing such kind of nice and wonderful collection......again, beautiful :) I love reading your posts. They make me happy . I like your post. IT's very helpful to me.GIFTBASKET.COM is carries GIFT BASKET, WINE BASKET, SPA BASKET, FRUIT BASKET, GOURMET GIFT BASKET, WINE GIFT BASKET, SPA GIFT BASKET, FRUIT GIFT BASKET etc. all at the prices you will love. Shop the latest GIFT BASKET, WINE BASKET, SPA BASKET, FRUIT BASKET, GOURMET GIFT BASKET, WINE GIFT BASKET, SPA GIFT BASKET, FRUIT GIFT BASKET looks at the lowest prices. this is so cute! where did you find the little baskets? thix xite creat good information ill like it. this site is very good looking and informative for us..
this is very good content..i like this blog. Jenny, just found your site through Traditional Home online magazine. Looking forward to seeing more of your wonderful ideas, photos, etc. Thanks!